Whether your family is flying the friendly skies, taking a train, or road tripping it, you’re going to need to keep your offspring occupied. Thankfully, many board games come in travel sizes to entertain kids on the go. Card games and board games keep minds active during the journey, at restaurants and back in the hotel room. Here are my picks for the best travel games for kids from preschoolers to teens. Peaceable Kingdom Preschool Write and Wipe Games to Go! Preschoolers can learn letters and words on the go with My First Bananagrams, a junior version of the popular Bananagrams word game. 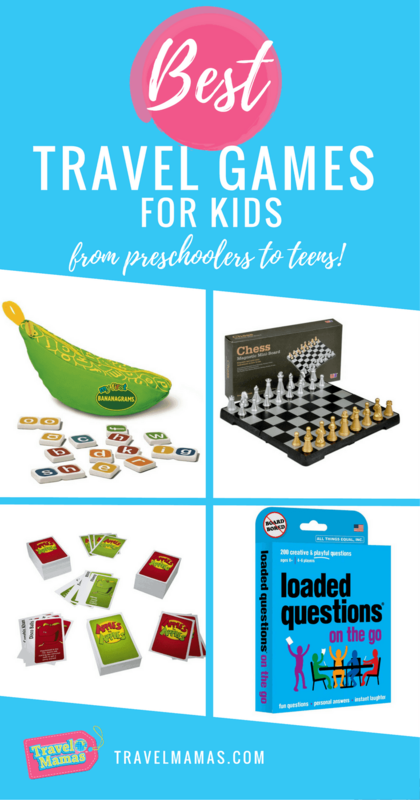 Get the Loaded Questions Junior On the Go game to play with younger siblings. (Ages 6+). For additional ideas for keeping kids content and while traveling, check out the Best Travel Toys for Kids from Babies to Teens. What are your favorite travel games for kids? Are there any we should add to this list? Let us know in the comments below! This story was originally posted in 2015 and was updated with new games and links in 2017. Carcassonne can be a winner for teens too. It packs down small, but isn’t good for in-flight or in-car gaming as a table is needed. I’ve never heard of that game, Craig. (But I did visit the town of Carcassonne in France years ago!) I will have to go look it up! Oh, and something like Bohnanza is a great single-pack-of-cards game perfect for most ages. Great list – there are so many great games out there now that didn’t exist when my kids were young! I think my tween/teen girls would enjoy Loaded Questions – it sounds like fun! My husband and I love to play the board game version of Loaded Questions on game nights with friends. Super fun! Have you heard of Munckin? Our older kids are loving this strategy game, and it’s easy to travel with because it only involves a deck of speciality cards. So fun! Amy – I haven’t heard of Munckin before. I’m going to go check it out now! There are some of our family favorites on here. We are also fans of card games so I often pack Uno and SkipBo. For the car I have a deckopedia box of road trip games that comes in very handy. I know Uno…will need to check out SkipBo and Deckopedia! We love Mad Libs! Kids can start with them in preschool and never grow out of them. They are a family road trip staple for us. Mad Libs in paper and app version are staples on our trips! A refreshing list of some great travel games to carry. I especially loved that you indicated the recommended age for each toy. Most of these toys are useful not only during travel, but also keeping kids engaged during the trip. So true, Trisk! Thank you for your comment! This is such an awesome resource! I love that you included games for all ages. Kids get bored, not matter how old they are, and no matter how old they are, when they get bored, they get annoying. Bwahahahaha. We travel quite a lot so if I can find some games that will pass the time I will definitely do it. This is quite a great list of games to play. I will definitely be pinning this. Thank you for the comment and the pin! This is awesome. We’re headed to Tennessee for Christmas. It is a looong drive from Florida! Enjoy your holiday travels, Mandie! I hope the travel games make the journey more enjoyable! Great ideas. We are always looking for games that will keep our tween/teen entertained. It’s harder in some ways as they get older ~ especially to keep them off technology! I love having games like this on hand for when we travel. We need new games since the kids are getting older now. It’s amazing how kids change. The minute we think we’ve got this parenting thing down, the kids change and so must we! These are great ideas. I really love the Write and Wipe games. They would make great gifts! They’re so fun, and compact, too! These are all great travel games. Battleship is another one we used to play while we traveled. Oh! Good one! I might add that one. I play Battleship with my son at home all the time! I am always looking for new games for our next road trip. I will have to pick up a few of these. My Son will love them. Great for holiday gifts, too! I have a few games we keep just for the car that way the kids do not get bored of them. Now that the kids are a little older they like to bring their Nintendo DS with them in the car. So smart to store travel games in the car! These are all great games for trips, for sure. But our family favorite is Bananagrams! Our whole family can play that one for hours on end. This post is perfect for my family. We travel a ton and I’m always looking for new ways to entertain the family. Yay! Glad you like our travel game picks! These look fun! I bet my kids will love these! Enjoy your family travel games! So glad you like our picks for travel games for kids! I hope your little one loves her matching game! These are cool travel games. Love them!